Edited on Jan. 12 with additional quotes. 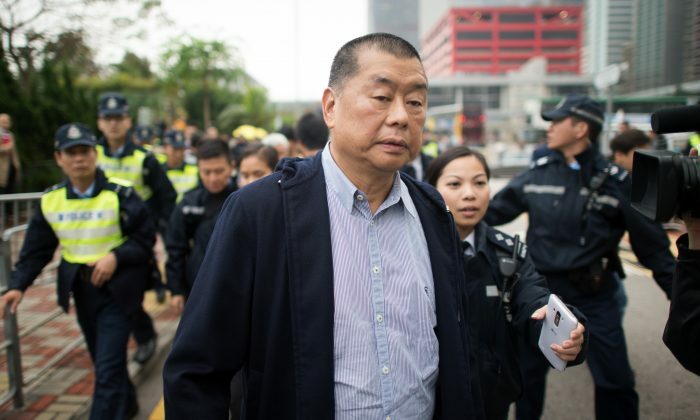 The headquarters of Next Media, one of Hong Kong’s largest media companies, and former owner Jimmy Lai’s home were attacked with what local media described as fire bombs early Monday morning. Both attacks took place at about 1:00 a.m. local time (Sunday, 12:00 p.m. Eastern Standard Time), according to Apple Daily, a Next Media publication. Eye-witnesses saw two fire bombs being hurled at the front gate of Next Media building from a seven-seater car. Close-circuit camera footage showed the front passenger throwing a bomb at each of the building’s entrances. Security guards notified the police, who later arrived on on scene to investigate. Judging by photographs uploaded on Apple Daily’s official Facebook page, the fire bombs stained the brick pavement, but the gate did not appear to suffer fire damage. Meanwhile, another seven-seater was spotted driving to Next Media founder Jimmy Lai’s mansion on Kadoorie Avenue. A masked man in a black sweater got out, threw a fire bomb—or perhaps merely a flare—at Lai’s gate, and left. The two vehicles were later found without their car plates and destroyed by fire at Tai Wo Ping Road and Sham Mong Road, two remote locations. Radio Television Hong Kong (RTHK) said that police are investigating the attack. Security guards at Lai’s mansion shouted at the man to stop and quickly doused the flames with fire extinguishers. No one was hurt in the incident. Police stood guard outside the compound after they arrived and documented the scene. The police have not given a statement on the specifics of the incendiary weapons used in the attacks. Ip Yut-kin, the publisher and editor-in-chief of Apple Daily, said the attacks are “ridiculous” and believes they are politically motivated by people who don’t support the paper’s pro-democracy views, according to RTHK. Simon added that Lai was untroubled by the attempted arson, returning immediately to bed after hearing the news. Lai told Wall Street Journal on Monday that he is not bothered or scared. Indeed, Lai and Next Media have been subjected to aggression for speaking their minds. The media mogul and his former company air pro-democracy views and openly supported the 79-day long occupation, termed the Umbrella Movement. The violence against him and his holdings are almost universally understood in Hong Kong to be retaliation for his pro-democracy speech—though he has generally refrained from attributing the violence to Beijing. In October, pro-Beijing, anti-Occupy demonstrators blocked the Next Media entrance to prevent Apple Daily newspapers from being delivered, and even poured soy sauce on papers that made it pass their barricade. And in November, a group of assailants dashed up to Lai and tossed animal offal at him at the main Occupy protest site near government offices in Admiralty. When police cleared the Admiralty site on Dec. 11 and arrested Lai for refusing to move from the streets, he announced his resignation as Apple Daily’s publisher. Three days later, Lai said he would step down as chairman and executive director of Next Media Ltd.
Lai said in a statement that he is resigning because he wishes to spend more time with his family and pursue personal interests. Cassian Cheung is the current interim chairman of the group. Some commentators suspect that Lai called it a day to relive some of the pressure from the company he founded. Because of Lai and Next Media’s pro-democracy stance, they have lost many lucrative advertising contracts with banks, finance consortiums, and major firms—the advertisers fear their business on the mainland may be affected if they continue to be affiliated with Lai and Next Media. But despite his attempts to distance himself from Next Media, both he and the company he founded have been unable to escape public and private backlash for their support of Hong Kong’s democracy movement. The Monday fire bomb attacks, while not causing any real damage, have been interpreted as a menacing reminder that there are forces in Hong Kong and on the mainland that still have their eye on the media mogul. "Report to police headquarters to assist investigations." A Chinese adviser recently suggested that Beijing should rein in Hong Kong's education sector because it helped foster the pro-democracy Umbrella protests.